One of the joys of being an opera lover is discovering voices of tomorrow, identifying young artists with the potential of greatness. Often the best place to find these vocal gems is in the competition arena. Many singers have gotten a jump start to their careers through winning important competitions. There's also something about a contest that excites the senses and makes one sit up and take notice. I've been attending competitions for almost fifty years, and it still captures my imagination every time. One gets to hear promising young artists with solid training and beautiful instruments, ready, willing and able to strive for a career in music. There are relatively few singing competitions in Canada - I can only think of the Montreal International Music Competition where the voice edition rotates with piano and violin. The Eckhardt-Gramatte Competition in Brandon, Manitoba also has a voice component in addition to violin and cello. The Mozart Competition that used to take place in Toronto back in the 80's under the sponsorship of the late Peter Sandor is no more with the passing of Mr. Sandor. Currently, there's the annual Christina and Louis Quilico Competition for the COC Ensemble Studio singers, to take place later this year. Centre Stage is relatively new as competitions go. 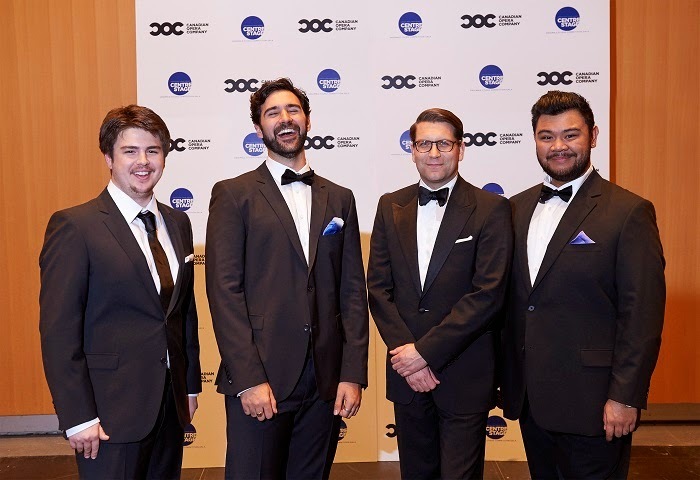 Through an auditioning process in several cities in Canada and in New York, aspiring singers are invited to compete on the stage of the Four Seasons Centre, with cash prizes as well as the possibility of becoming a member of the COC Ensemble Studio. In three short years, it has blossomed into a major event, with a fund-raising gala component. 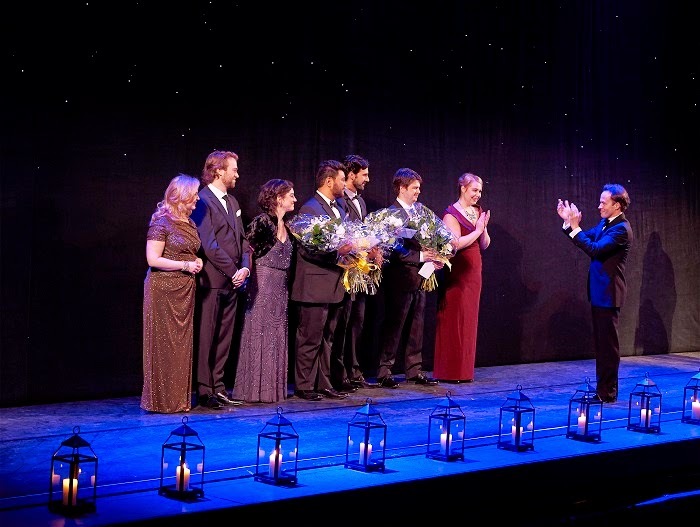 The last two competitions had some major voices the likes of soprano Karine Boucher, tenor Andrew Haji, baritone Gordon Bintner, and mezzo Charlotte Burrage, all are now valuable members of the Ensemble Studio roster as a result of their strong performances. This year, seven finalists hope to do the same. The attendance has grown substantially since moving from the Richard Bradshaw Amphitheatre to the mainstage of the Four Seasons, with full orchestra under the direction of COC Music Director Johannes Debus. 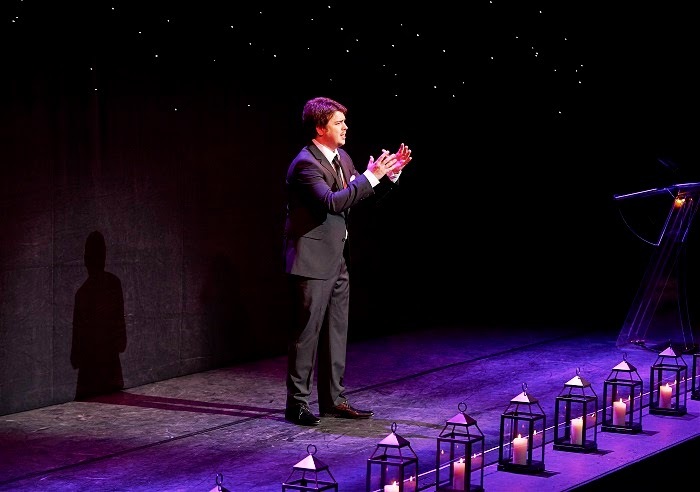 For a cool $1500, one gets to have a gourmet dinner on the stage of the opera house after the conclusion of the event. 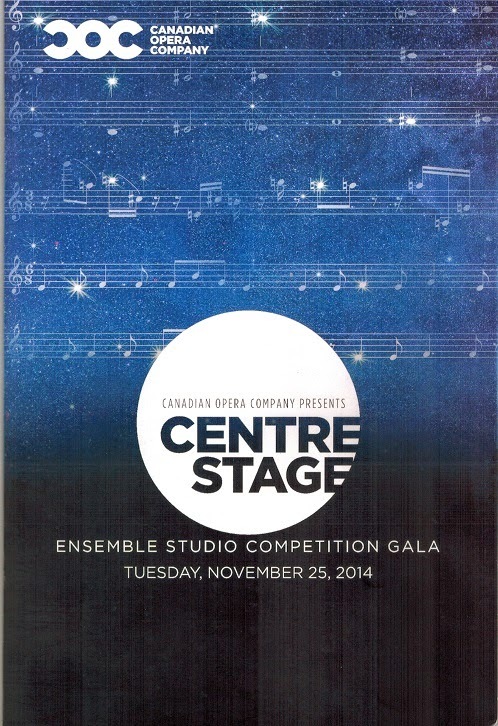 The tariff for the competition itself including a pre-performance reception is a more modest $100 per ticket. Given the gala component, the Four Seasons lobby last evening took on a festive atmosphere, where well dressed audience members sampled the fancy cheeses and the assortment of drinks. But of course the main event was the competition itself. Unlike last year when there was a private session where the finalists sang in front of the jury panel without a public audience, this year all of it was open to the public. The event started a few minutes after 6:30 pm, with Canadian tenor Ben Heppner as the MC. After a few brief comments by him and General Director Alexander Neef, the competition started in earnest with Victoria BC native mezzo-soprano Michelle Siemens. In Sara's aria from Roberto Devereux, Siemens showed off an impressively big, rich, resonant voice. This aria represents Donizetti at his best, and Siemens sang this short aria with its Bellini-like cantilena very well, if without much chiaroscuro. If I were to quibble, she used repeated and generalized hand gestures throughout. A more thought out, judicious use of hand and facial expressions to truly illuminate the text would have been better. Still, I feel it's an aria that showed off her strength. Her second piece, "Voi che sapete" was not so suited to her, as I don't really see her as a convincing Cherubino. She sang it rather blandly, without much variation in expression vocally or dramatically. That said, Siemens has a quality "true" mezzo voice that's well worth hearing. Next up was PEI baritone Nathan Keoughan. If memory serves, he sang at the FSC last year. Both La calunnia and Se vuoi ballare showed off his sturdy baritone to advantage. He sang with quite nice expression and looked good on stage. I was unfamiliar with the voice of Toronto mezzo Zoe Band, so it was a pleasure to hear her high mezzo. Sesto's aria, Parto, parto, is one of the most challenging in her voice category. She sang with a beautiful timbre, very nice legato, excellent sense of pitch, a fast but unobtrusive vibrato, and overall she did very well in this piece. A fly in the ointment was the less than sparkling coloratura with some smudged attacks in the presto section near the end of the long aria. A very nice and highly promising voice that is a work in progress. Another issue is the rather compact size of her instrument, perhaps a bit small given the size of the opera houses today. But with time it may likely grow in strength and volume. Erika's "Must the Winter Come So Soon?" is a very beautiful aria and often sung in competitions, something that I've always found a little curious, as it's not exactly a showy piece. I would have preferred something like the Composer's Aria from Ariadne. To be sure, Zoe Band's is a voice to watch. For those of us who attend U of T Faculty of Music presentations, tenor Charles Sy is a familiar presence. Over the last two or three years, his development has been amazing. Most recently I heard him sing in the Ben Heppner masterclass and he acquitted himself beautifully. 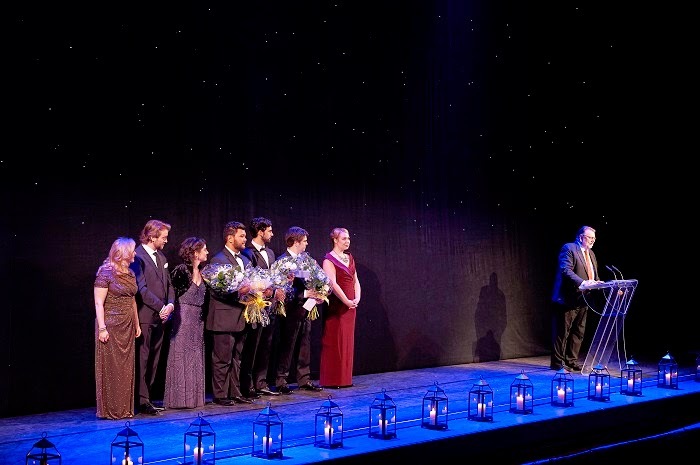 Tonight, he sang two pieces that served his predecessor, fellow U of T tenor Andrew Haji well two years ago and in the recent competition in Holland - Dies Bildnis and Una furtiva lagrima. Sy sang with lovely, warm tone that was a pleasure to the ear. He offered perfect expression and a surfeit of elegance in both arias, and negotiated the treacherous final minute of Nemorino's aria beautifully. An excellent performance. 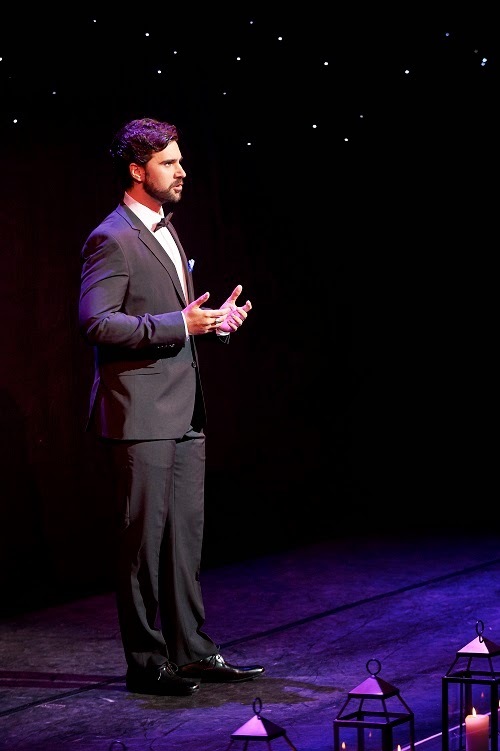 Baritone Dimitri Katotakis followed with the Count's aria from Nozze, singing with ingratiating tone and nice stage presence. His high register was impressive, and he sang a very strong high note at the end. A very interesting voice, one that almost make me want to say he is a tenor, not a true baritone, or perhaps a baryton martin? In any case, I would be really curious to hear him as Pelleas. 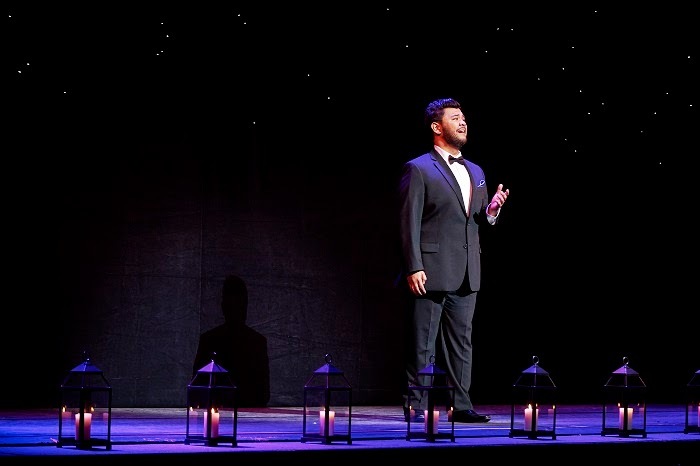 Next up was Newfoundland tenor Aaron Sheppard in the beautiful aria from Le roi d'Y's, a piece that served tenor Jean-Philippe Fortier-Lazure so well last year in the competition. Sheppard had a bit of a tentative start with minor pitch issues, but he recovered quickly and sang with beautiful mezza voce and lovely piano notes where it counted. Perhaps it's a bit of nervous tension, I detected some flatness here and there, but over all, it was a very nice performance, executed with poise. The final competitor was Stratford native soprano Eliza Johnson. The Ilia's aria and Juliette's Waltz are both well suited to her lyric soprano. Nice tone, albeit with some excess flutter. I also detected some pitch issues here and a general rushing of tempo perhaps due to nerves. A firmer, more defined trill would serve her well, as it's very important in Juliette's aria. With the jury went off to deliberate, the surprise guest came on to - as Ben Heppner quipped - "show how it's done!" It was none other than Adrianne Pieczonka, who sang three pieces, Wally's aria "Ebben, ne andro lontana," "Pace, pace" and the Strauss Lied "Zueignung." And she indeed showed how it's done! What gorgeous, big voiced singing. Perhaps it's unfair to say that one can hear a real difference between the contestants and Pieczonka, but that's calling a spade a spade. Here you have a world class singer at the height of her powers - of course she's better! But you know what? All the contestants can aspire to reach that level, and who knows, perhaps some of them will.